Before you use (or abuse) the domain name space, you ought to learn how it's structured, and why it was done that way! Only then can you understand what's been done with domains in the past, what's going on in the present, and what's being implemented or proposed for the future. An essay on the history of the domain name system, how it came about, and how it got all screwed up! How the domain name system is hierarchically structured, and how you can make use of the power of this structure. 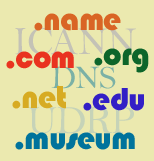 Information about the traditional domain endings, such as .com and .org. Information about the new domain endings which were added in 2001 (with actual implementation stretched out over several years following). Information about the second round of new TLD additions, starting in 2004. Information about the ongoing addition of new TLDs planned to begin in 2010. Every country of the world has its own top-level domain, and some of them are even being used. Some people are trying to "route around" the problems with the domain name system rather than reform it from within. This page was first created 14 Mar 2001, and was last modified 28 Oct 2009.